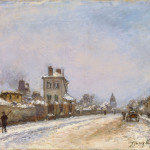 Arriving in Paris in 1844, a decade before the dramatic changes initiated by Baron Georges-Eugène Haussmann (1809-1891) had begun, and wintering in the city long after the boulevards and gaslights had been created and installed, Johan Jongkind witnessed a landscape in a state of rapid flux and motion. The pictures that he produced during these historic years reveal the work of Paris’s urban transformation and the changing fabric of the city, through a variety of atmospheric conditions and formal effects. 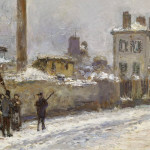 In Street Scene in Paris in Winter, Jongkind presents a panoramic view of a well-known site in the 6th arrondissement, the Rue Notre-Dame-des-Champs. Far from a topographical portrait, however, Jongkind’s painting provides insights into the artist’s influential aesthetic and technical processes, and into the temperament of Paris at mid-century as well. Jongkind’s years in Paris began in the studio of Eugène Isabey (1803-1886), and, from 1848, with regular submissions to the annual Salon. By 1849, however, the artist was already veering away from the conventions of academicism and toward a more avant-garde approach. Pictures of a single subject, made at different times of day and year, began to appear regularly in his oeuvre, in watercolor, ink, and oil, and unusual vantage points became a hallmark of his art. 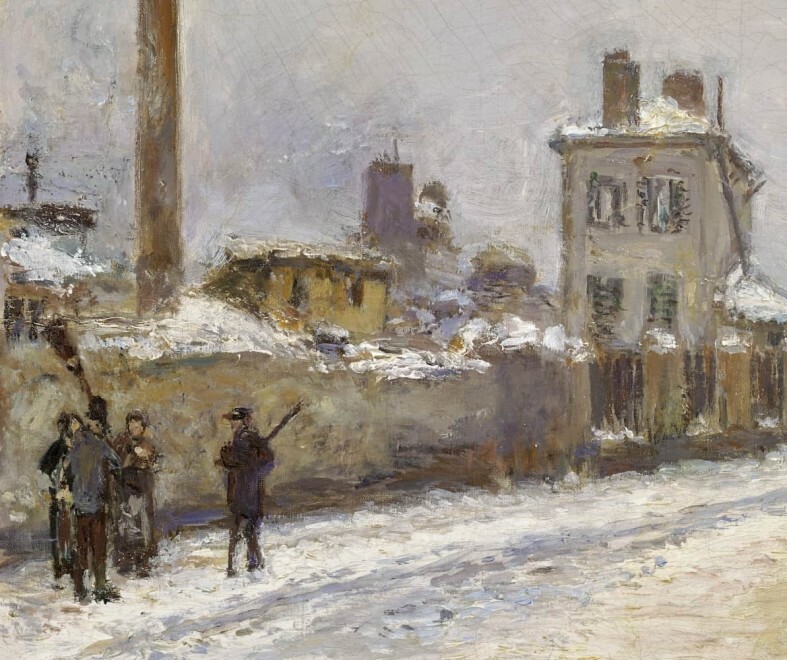 Street scenes in particular, each precisely dated, were painted in an exuberantly impressionistic style that few in Paris could ignore: “[They] give the idea of sketches dashed off in a few hours,” Zola observed, “for fear of letting the first impression escape. The truth is that the artist works his canvases at length, to arrive at this extreme simplicity and unheard-of finesse; everything happens in his eye, in his hand.” These innovative paintings, with their short, small strokes of color, sensitivity to the transience of light and shadow, and preoccupation with the idea of the “series,” or group, would influence an entire generation of Impressionist painters in France, but perhaps none so profoundly as Camille Pissarro (1830-1903) and Claude Monet (1840-1926). Pissarro’s fourteen pictures of the Boulevard Montmartre, for example, painted from a room at the Grand Hôtel de Russie during the last decade of his life, depict the iconic thoroughfare from every meteorological point of view. Three decades before Pissarro’s project began, in 1872, Jongkind painted the first of at least two oil views of the Rue Notre-Dame-des-Champs (fig. 2). 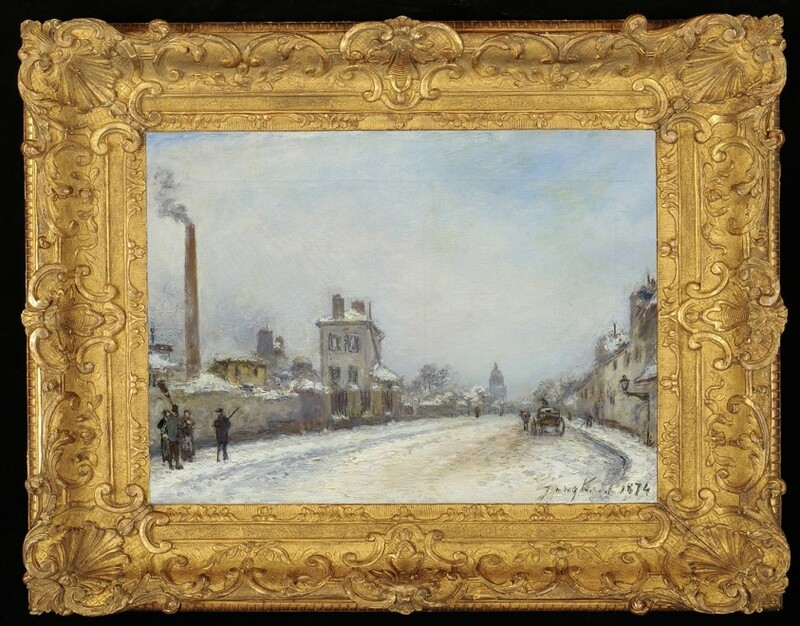 (Street Scene in Paris in Winter, dated 1874, is the second of these important works.) Home to numerous artists and cultural luminaries – including, at different times, Gustave Courbet (1819-1877), Jean-Léon Gérôme (1824-1904), William Bouguereau (1825-1905), Paul Cézanne (1839-1906), and Pierre-Auguste Renoir (1841-1919) – this site was also part of the newly transformed landscape of the City of Light, and a signal, therefore, of the modern experience, in all its grit and grandeur, that Jongkind found so compelling. The first owners of this work, the Tempelaere brothers, were major dealers of Henri Fantin-Latour (1836-1904) and other prominent French artists of the day. “Cet amour profond du Paris moderne, je l'ai retrouvé dans Jongkind …,” Émile Zola, “Jongkind,” Lettres parisiennes, published in La Cloche, January 24, 1872, n.p. During the process of Paris’s “Haussmannization,” hundreds of miles of small narrow streets, especially in the city center, were altered to make way for 85 miles of wide, tree-lined avenues and boulevards. Haussmann’s urban transformations also included the introduction of 15,000 gaslights into Paris by 1870, allowing Parisians to venture onto the boulevards after dark, and profoundly affecting the culture of the city. Interestingly, Jongkind’s urban scenes depict the subjects that most artists sought to avoid: the signs of destruction in the metropolis during the process of Haussmannization and the areas away from the fashionable districts. Though Jongkind may have used a camera obscura to correctly render specific architectural details, the overall accuracy of his images was often compromised for aesthetic effect. Jongkind exhibited works in 1848, 1850, 1852, 1853, 1855, 1864, 1865, 1866, 1867, 1868, 1869, 1870, and 1872. Despite his Dutch heritage, Jongkind chose to exhibit only in the sections devoted to French artists. See, for example, Jongkind’s renditions of Notre Dame Cathedral by day and in moonlight (these include The Cathedral of Notre Dame de Paris, seen from the Pont de l’Archevêché, 1849, oil on canvas, 13 ¾ x 23 7/8 in. [35 x 60.6 cm], Santa Barbara Museum of Art; Notre Dame of Paris, Seen from St. Michel Quay with a Small Bridge, 1854, oil on canvas, 10 ½ x 15 ¾ in. [27 x 40 cm], Louvre, Paris; and Notre Dame of Paris Seen from the Quai de la Tournelle, 6 June 1863, watercolor, 13 ½ x 20 ¾ in. [34.7 x 52.6 cm], Yale University Art Gallery), as well as a sketchbook from 1849, now in the collection of the Louvre. In the latter, Jongkind’s croquis, or rapidly executed sketches, also feature the iconic Cathedral of Notre Dame. Other French artists who created serial representations of cathedrals in the wake of Jongkind’s example are: Camille Pissarro (1830-1903), Alfred Sisley (1839-1899), Maximilien Luce (1858-1941), Albert Marquet (1875-1947), Robert Delaunay (1885-1941), and, most famously, Claude Monet (1840-1926). “On dirait des ébauches jetées en quelques heures, par crainte de laisser échapper l'impression première. La vérité est que l'artiste travaille longuement ses toiles, pour arriver à cette extrême simplicité et à cette finesse inouïe ; tout se passe dans son oeil, dans sa main,” Émile Zola, “Jongkind,” Lettres parisiennes, published in La Cloche, January 24, 1872, n. p.
Not all critics were so encouraging; indeed, Jongkind suffered a regular stream of negativity and multiple Salon refusals during the course of his mature career. Monet’s paintings depicting Rouen Cathedral and grain stacks, and Pissarro’s sequences of city views (see fig. 1), are among their best-known “series” works. Interestingly, given his affinities with the group, Jongkind did not participate in the first Impressionist exhibition, held in the same year as this picture’s creation. Several sketches for the finished oils exist. These include: Rue Notre-Dame-des-Champs, 22 July 1861, pencil and watercolor on paper; 7 ⅘ x 9 ⅘ in. (20 x 25 cm), Collection of Melle Allibert; and Rue Notre-Dame-des-Champs, ca. 1864, pencil and watercolor on paper, 6 ½ x 9 in. (16.5 x 23 cm), Collection of Antoine Puy/Private Collection. This site should not be confused – as it long has been - with Jongkind’s depictions of the Rue Notre Dame (Cf. 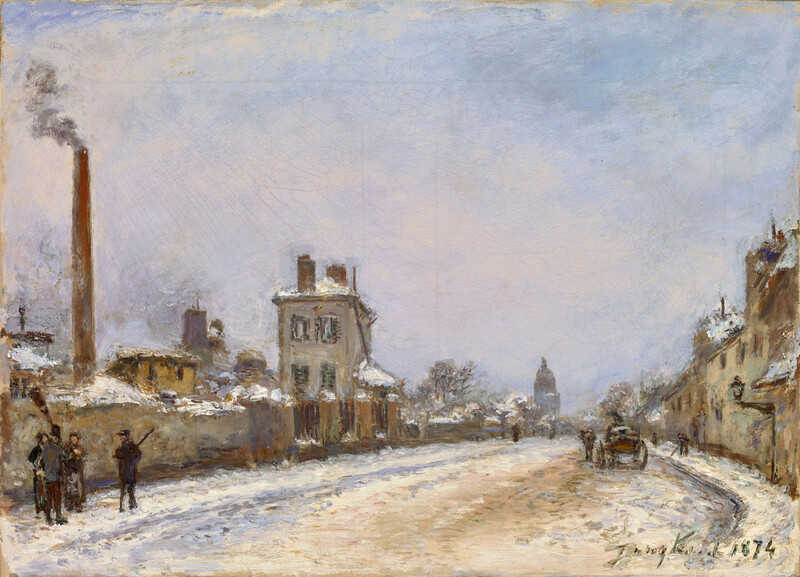 Rue Notre-Dame à Paris, 1866, oil on canvas, 18 ½ x 23 in. [47 x 58.5 cm], Rijksmuseum, Amsterdam). Additional residents were: Victor Hugo (1802-1885), Charles Gleyre (1806-1874), Paul Baudry (1828-1886), James McNeill Whistler (1834-1903), Jean-Paul Laurens (1838-1921), John Singer Sargent (1856-1925), Camille Claudel (1864-1943), Emile Othon-Friesz (1879-1949), Fernand Léger (1881-1955), Ezra Pound (1885-1972), and Ernest Hemingway (1899-1961), to name but an impressive few. Painted in 1854, Rue à Paris au Clair de Lune (Private Collection), may be Jongkind’s earliest Parisian factory scene. The low horizon in this painting, giving prominence to the sky, was typical of Jongkind’s work, and reminiscent of the pictures of the 17th century Dutch artists he so admired. The unseen “workers” on the scene, of course, are the artists who made this street their home. A pencil and watercolor sketch for this site, dated 9 July 1867 and measuring 5 x 8 ¼ in. (13 x 21 cm), is now in a private collection. The emotive quality added by the dark palette of Jongkind’s earlier moonlit scene did not go unnoticed by his peers: “…as a ray of sunshine brightens Paris, or a dark sky makes it dream, the city has various emotions, becomes a poem of joy or melancholy.” [“. . . selon qu'un rayon de soleil égaie Paris, ou qu'un ciel sombre le fasse rêver, la ville a des émotions diverses, devient un poème de joie ou de mélancolie.”] Émile Zola, “Jongkind,” Lettres parisiennes, published in La Cloche, January 24, 1872, n. p.
 “Sa peinture était trop nouvelle et d’une note bien trop artistique pour qu’on l’appréciat . . . ,” Claude Monet, quoted in François Thiébault-Sisson, “Claude Monet, an Interview,” Le Temps, Paris, November 27, 1900, p. 3. Further indicating Jongkind’s sense of detachment from the Parisian art scene are the subjects of his works at this time: the majority painted between 1873 and 1877 were imaginary landscapes set in the artist’s native Holland. Compare Walter Sickert’s congested, up-close view (cf. The Notre-Dame des Champs: The Entrance to Sargent’s Studio, ca. 1907, oil on canvas, Ashmolean Museum of Art and Archaeology). Jongkind painted other urban winter scenes as well (cf. 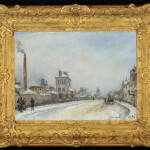 Boulevard des Invalides sous la neige, Paris, 1878, oil on canvas, 9 ¾ x 12 ⅘ in. [24.7 x 32.7 cm], Musée Faure, Aix-les-Bains).